*Editors Note: This is an advanced review, comic hits stores on August 26th. First issues have pacing problems, world building problems, first issues have a hard time introducing characters and threats. And sometimes you can overlook these problems because despite them you really like the final product that was delivered. Other times you can get a first issue that doesn’t have any of these problems but just doesn’t hit the right notes to make you want to go on and keep reading the mini or ongoing. It’s almost always a mixed bag. Some first issues are bad comics but great first issues, while most first issues are bad first issues and okay comics. Zodiac Starforce #1 was a great first issue and a great comic book. The only “problems” I found with this comic are that I want to read more of it and I want to read more of it now. 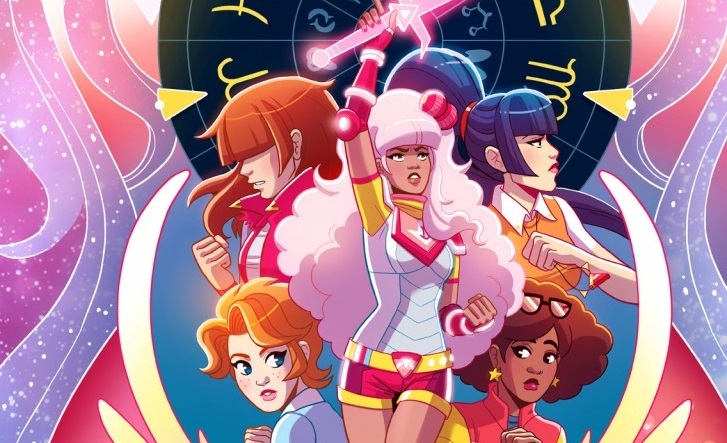 Zodiac Starforce is about a group of teenage girls – Emma, Kim, Savanna & Molly – who are granted cosmic abilities by a goddess known as Astra to defend the Earth from the forces of the evil being Cimmeria. And they win. Our story opens two years later as the girls, now sixteen, are all adjusting to the constraints of normal teenage life having once participated in battles of cosmic importance. Some of them are taking it better than others. Emma, former leader of the Starforce, just wants to move and be a teenager, while Kim, the team’s bruiser, wants nothing more than to get the band back together for one last hurrah. And it seems like she might get her wish as monsters have returned to Alexandria, Virginia and dark forces begin to stir in the realm of Nephos. Please tell me that got your interest, because it should. Kevin Panetta comes out of the gate swinging on writing duties. The first part of this story is well-paced, the reader isn’t overly bogged down with information – just enough clues are sown into the narrative to make you want to know more – plus he avoids one of my biggest pet peeves when it comes to comic books: the teenagers actually sound like teenagers. And now I’ve got to talk about the art. Good lord, Paulina Ganucheau’s art is truly something to behold. I think what really makes it work is the way she sort of wears her influences on her sleeve. The art reads like a mashup of Gem & The Holograms and Scott Pilgrim with a dash of tumblr fashion bloggers sprinkled on top. And it works so damn well. The Starforce girls all have great designs, both transformed and otherwise, and Ganucheau goes out of her way to make each and every character on the page look like a distinct human being. I won’t name names but there are some artists out there who just draw the same face on slightly different bodies where Ganucheau makes sure everyone is distinct, from eyes to noses to mouths and even eyeliner. It’s fantastic. I also can’t forget to give proper credit to Savanna Ganucheau who assisted on colors – which are a joy to take in. They’re this hazy, dream-like pastel that reminds me of the video game manual art of years gone by. I keep wanting to describe this book at “Sailor Moon meets….” and while the influence and inspiration is clearly there, there’s more going on than that and reducing it would be doing this book a disservice. It’s more “waking up at 6 am and hoping to catch an episode of Sailor Moon before it’s time to get ready for school” meets a damn good comic book. Zodiac Starforce #1 not only managed to avoid some of the biggest pitfalls which can sink a new series before it leaves the dock, it completely shattered my expectations for the kind of quality a first issue can and should deliver to readers. Go read this comic. If you read this comic or just dug the review, please let us know your thoughts in the comments below! GWW Capes Crew 111: Zappcon’s Back, Alright!